Autumn is my favourite time of year. 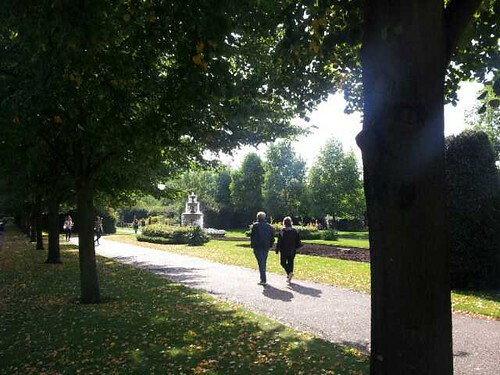 The light is golden, the leaves are rustling, the air is crisp. The sweaters are out of storage. The harvest is in, and it’s time to spend a little more time indoors. It’s traditional to make the most of the harvest by preserving as much of it as you can for the colder months. Mum says that when she first moved to New Zealand in 1970 every woman had a shelf of home made jams in her pantry. Poky London flats don’t have pantries but you’ll find all manner of jams, pickles and preserves lurking at the back of my kitchen cupboards! The other day I decided to try making some nasturtium “capers”, which aren’t actually capers at all but can be used in the same way. Capers are the flower buds of the caper bush. Nasturtium “capers” on the other hand are actually made from the seed pods that appear once the plant has flowered. Nasturtiums are one of the only things that have thrived on my little plot this year (next year I won’t take a holiday in the middle of a heat wave) so I had plenty of seed pods to pick. I used this recipe. I’m looking forward to trying them in some recipes now. A couple of years ago I helped “Culinary Anthropologist” Anna Colquhoun with one of her seasonal preserving classes. One of the things we made was balsamic pickled onions, and luckily there was enough left over for me to take home a jar. I’d actually always turned my nose up at pickled onions, but after I tried them I was a complete convert. So on Sunday I wandered through Regent’s Park to the Marylebone Farmers’ Market, where I picked through a basket of organic onions to find the smallest ones. I peeled and salted them on Sunday evening and finished making them today. 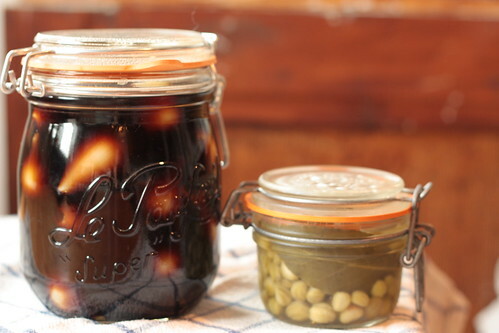 Anna has kindly allowed me to share her recipe for the balsamic pickled onions. I halved the recipe to fit my small Le Parfait jar, but I think I’ll be making another batch soon. This recipe is adapted from Pam Corbin’s excellent River Cottage Preserves book. I prefer using balsamic vinegar – the flavour is deeper and sweeter. But don’t use the super expensive, syrupy real one – identified by the words ‘tradizionale’ and ‘di Modena’ or ‘di Reggio Emilia’ on the label – it will cost you a small fortune, be too sweet, and a waste of what is really a condiment to be drizzled. A cheapish one will do, but check it’s made with real grape must and wine vinegar and nothing else. Once it’s made, you must resist eating the onions for a while as their flavour and texture only improves with time. Then no bread ‘n’ cheese lunch will be complete without them. Bring a large pan of water to a rolling boil. Add onions and blanch briefly (a minute is more than enough). Drain, refresh in cold water, then carefully peel. Blanching first simply makes peeling easier. In a wide container, sprinkle salt over onions and leave overnight. This draws out some water and will keep the onions crisp once pickled. Salt also helps keep the pickle clear. Salt with anti-caking agents in it can cause the pickle to go cloudy. Rinse off the salt and pack onions into a large sterilised jar. Tuck in a couple of bay leaves as you go. Put vinegars, sugars and spices in a saucepan and bring to a boil, stirring to dissolve the sugar. Simmer gently 5 mins then leave to infuse 5 mins, or longer if you want a very spicy pickle. Strain vinegars over onions and let cool completely. Close lid and leave somewhere cool for a few months before eating. Use within a year. The jars were a kind gift from Le Parfait. Check out Anna’s upcoming preserving classes on 12th and 13th October.